Governor Andrew M. Cuomo today announced the expansion of the state’s Crime Analysis Center network to Dutchess, Orange and Ulster counties. The Hudson Valley Crime Analysis Center is the ninth intelligence and data-sharing center established by the state Division of Criminal Justice Services in partnership with local law enforcement agencies. It will provide investigative support and information to help police and prosecutors in the region more effectively solve, reduce, and prevent crime. Located at the Orange County Emergency Services Center in Goshen, the Hudson Valley Center serves 65 police agencies in the three-county area that includes 96 municipalities and more than 2,700 square miles. The Center began operations in March and presently has a staff of 14 full- and part-time crime analysts and investigators from the Orange County Sheriff’s Office and county Emergency Services; Ulster County Sheriff’s Office; and police departments in the cities of Newburgh, Poughkeepsie and Middletown; the village of Montgomery and town of New Windsor. New York State invested approximately $410,000 to renovate a 2,300-square-foot space within the Orange County Emergency Services Center to host the Crime Analysis Center. 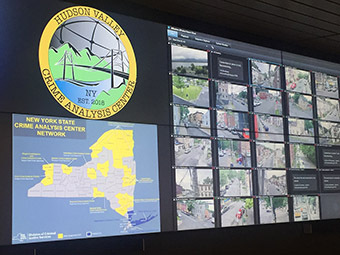 The Center features a state-of-the-art video wall measuring 4½ -feet high by 20-feet wide that displays multiple sources of data and information in real time, including feeds from public surveillance cameras in the cities of Newburgh and Middletown, ShotSpotter technology used by the city of Newburgh and computer-aided dispatch feeds from both Ulster and Orange counties. Since launching operations this spring, staff at the Hudson Valley Center have already provided valuable assistance to law enforcement. For example, their work has assisted with the investigation of a fraud case, helped police solve a bank robbery, and led to the arrest of an individual who was using social media to threaten and compel young teens to provide explicit photos of themselves. Collectively, the work done by staff at the Centers since the network’s inception in 2007 has assisted with the resolution of more than 2,500 cases. The state invests approximately $7 million to support all nine Centers, which serve 19 counties and more than 300 agencies from Western New York to the North Country and Southern Tier to the Capital Region. Centers will assist any law enforcement agency upon request. Click here for a map of the network. In addition to being connected to each other, Crime Analysis Centers in the state-supported network have access to information from locally supported centers in Nassau, Suffolk, and Westchester counties. The State Police, state Department of Corrections and Community Supervision, state Department of Motor Vehicles, and federal Probation Department also permit all state-supported Centers to access information they maintain. The Hudson Valley Center currently operates Monday through Friday. Staff also will be assigned in the near future from the Orange County District Attorney’s Office, New York-New Jersey High Intensity Drug Trafficking Area, and the New York Air National Guard, bringing total staff to 20. The staff will eventually expand operations to evenings and weekends. The Center is overseen by a 11-member Board of Directors with representatives from the police departments in the cities of Kingston, Middletown, Newburgh and Poughkeepsie; the district attorney’s offices and sheriff’s offices from Dutchess, Orange and Ulster counties; and the Division of Criminal Justice Services. A state-funded Director oversees the day-to-day operations.